This book is a collection of interviews of celebrities. 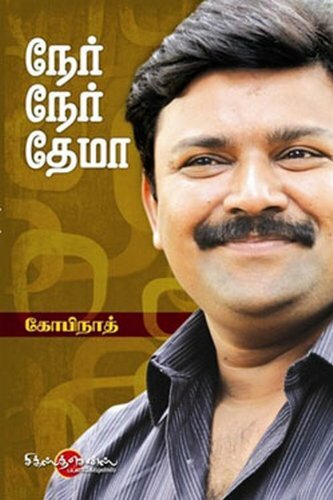 The author, Gobinath, conducted all of these interviews for Vijay TV. Summary of the Book This book comprises of a collection of interviews that were conducted by Gobinath of several famous celebrities like Karunanidhi, Sivakumar, Vijayakanth, Vairamuthu, Solomon Pappaiah and Padma Subrahmanyam. In these interviews, the celebrities speak about their past life, success and failures. They are all people who have struggled to come up in life and achieve their goals. This book will be an enjoyable read for those who are interested in any of the famous personalities who have been interviewed by Gobinath. The reader will get to learn many interesting details of their lives or their favourite celebrities. It also contains a lot of good advice from these popular people that will be useful for us. About Gobinath Gobinath is an Indian television anchor, radio jockey, journalist, reporter, writer, newsreader and entrepreneur. He is often called “Neeya Naana” Gobinath.